Last Friday saw the inaugural meeting of the Analogue Club in Belfast; our numbers were few but the conversation was rich and the guacamole was good! Our conversations pivoted around the ideas of community/interdependence, and independence/isolation presented in Laxness’ “Independent People”, and how the vast soundscapes Ólafur Arnalds highlighted the sheer size and beauty of the Icelandic landscape, highlighting the plight of our stubborn protagonist Bjartur and his isolated croft amidst the inhospitable Icelandic wilds. We are excited to finish this Icelandic pairing and welcome any thoughts or reflections you may have. We’ve been aware that at times, communication has failed us in our beggings, and ultimately feel the Facebook page hasn’t served us as well as intended. As such we have decided to change our Facebook presence to that of a group. Through this we can better share thoughts, ideas, and events, as well as having a direct line of communication through Facebook messages. Any and all feedback on all of this would be very welcome. 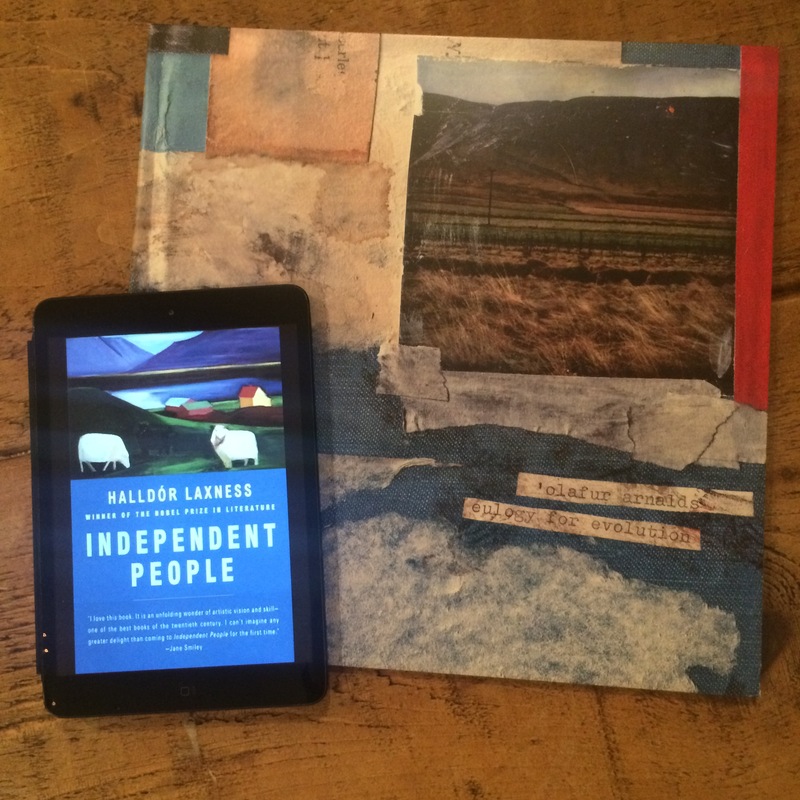 Independent People by Halldór Laxness, with Ólafur Arnalds‘ debut album Eulogy For Evolution. We’re excited for the first month of this little experiment, and are excited to see how people get on… Does the pairing work? How do you feel it influences your reading or listening experience? On reflection what do you think links the two, if anything? If you’re unable to read the whole book, we’d still love to hear your input, and thoughts & feelings from the pairing, even if you only read one chapter or a few pages. We’ll host an event at our house in Belfast, Northern Ireland on 6th March 2015 – keep your eyes peeled on Facebook for more info on that soon! If your favourite of the three was not the chosen pairing this time around do not dismay! Some of the pairings will come back around for group vote if they’ve been particularly popular. Equally, feel totally free to explore any of the pairings for yourself: let us know if you do, as we’d love to hear your thoughts. We’d also love to hear any pairing ideas from you guys! Either comment on here, or give us a yell on the Facebook Page and we’d love to put up for future vote. In the meantime, we hope you enjoy the works on offer this month, and look forward to hearing your thoughts in the coming weeks! If you’d like, you can check out NPR’s “You Must Read This” series, where Christina Sunley gives a hearty recommendation for Independent People, and her feelings for the book, and the characters within. Firstly, a huge thank you to everyone for the overwhelmingly positive response to this little idea. We are really excited by just how many people seem to be up for this little experiment and are really excited to share the journey with such a vibrant community as we explore the relationship and intersections between music and books. With this community spirit firmly in mind, we have decided to have a monthly vote for which pairing to explore in the coming weeks… In the following post we will give a brief overview of each Book & Album pairing, and the relationship between them. Vote for the pairing you’re most excited by / interested in, and then we will publish the result this Friday (6th February). 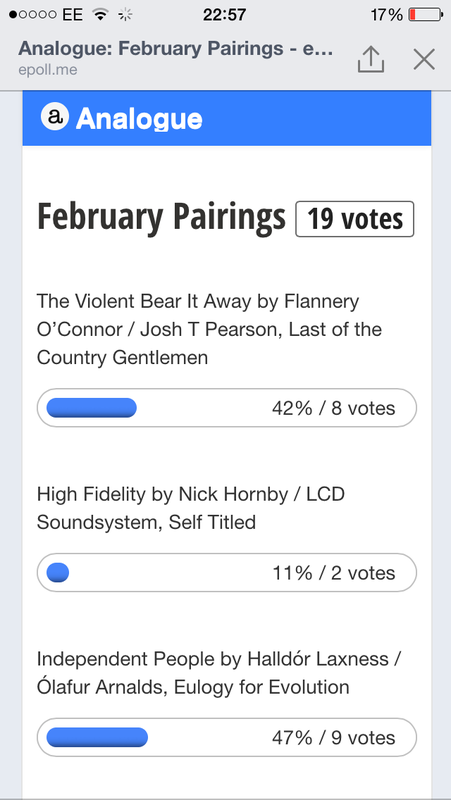 Up first we have a pairing of The Violent Bear It Away by Flannery O’Connor / Josh T Pearson, Last of the Country Gentlemen: These two works are linked by genre; Southern Gothic – thematically dealing with issues of social decay and dealing with issues of poverty, crime, alienation, and violence. With use of religious imagery, and often eccentric and deeply flawed characters. O’Connor draws heavily from her Roman Catholic background, and through her use of grotesque characters and situations looks at questions of morality and ethics. 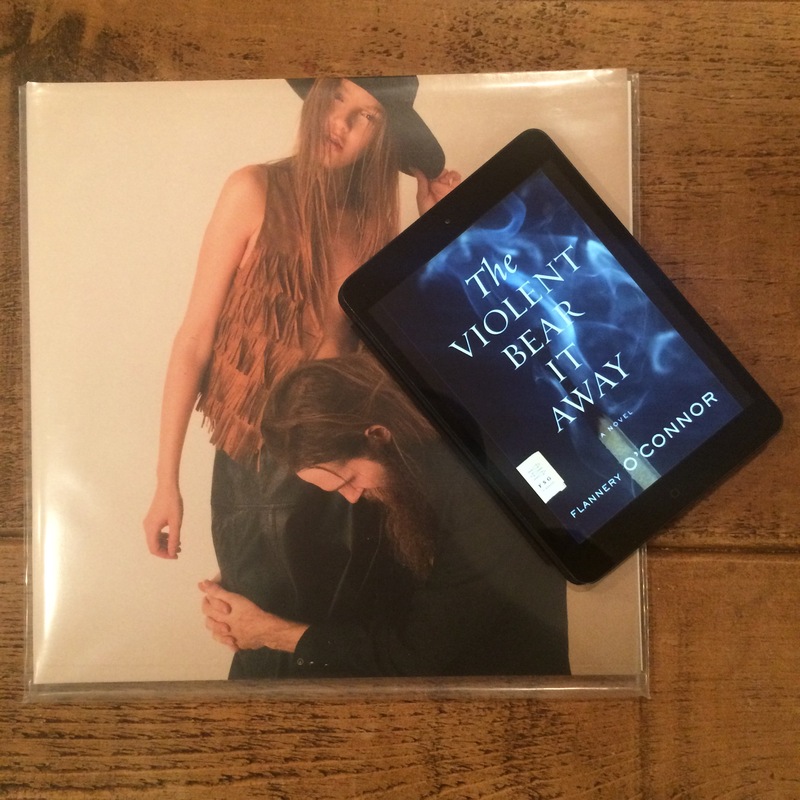 In her second, and final novel The Violent Bear it Away, O’Connor looks at the life of 14-year-old Francis Tarwater, who is trying to escape his destiny: the life of a prophet. Through this story she deals with themes of destruction and redemption, and the secular being dominated by religion and destiny. In interviews around Josh T Pearson’s debut album Last of the Country Gentlemen, he talks about the albums’ themes of pain and heartbreak in the wake of a failed relationship, and how he treated the songwriting process as confession to absolve him from sin, and finding redemption through the performance of those songs. Similarly to O’Connor, religious heritage plays a strong role through the themes and language within: the Texas-born singer being the son of a Pentecostal Preacher, and pointing to how he drew influence from the iambic metre of the King James version of the Bible. We are interested to see how these two works linked-by-genre, will intertwine, and push-and-pull as we read and listen side-by-side. Up next we have High Fidelity by Nick Hornby / LCD Soundsystem, Self Titled: chronicles of coming-of-age in Generation X. 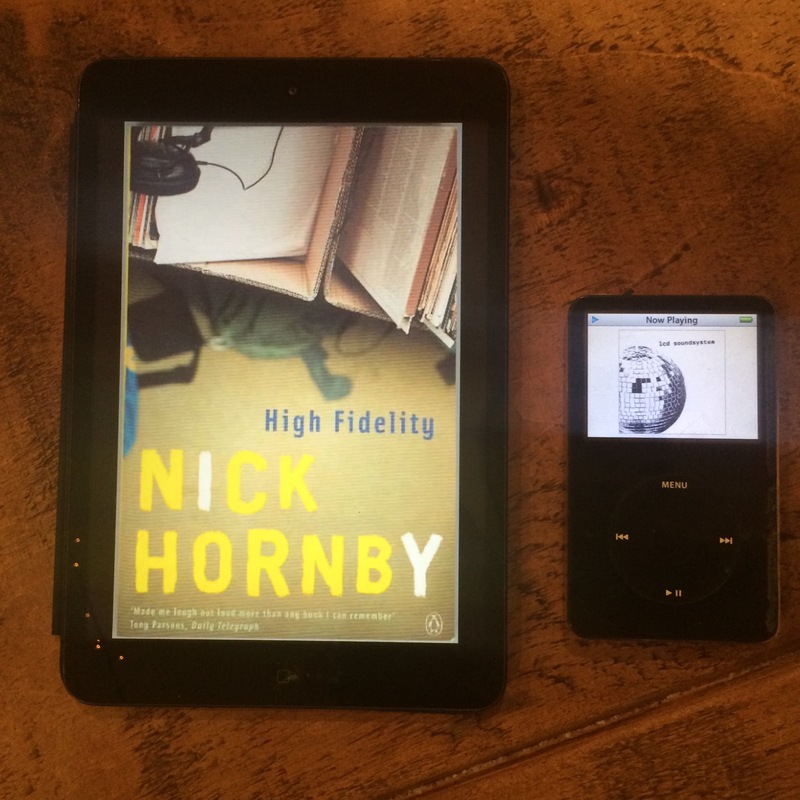 In High Fidelity we see Nick Hornby’s somewhat iconic capturing of the angst, sarcasm, and self-deprecation of a 30-something man coming to turns with his failed relationships, lack of achievements, and advancing years. Within the mind of Rob Flemish, we find a neurotic music snob, with a particular affinity for list-making, and an appreciation for the finer points of mixtape creation. The debut album from James Murphy as LCD Soundsystem similarly catches some of the angst of an ageing Generation X, even echoing Flemish’s self-deprecation, sarcasm, and deflecting humour in lyrical study of his loss of credibility and ‘cool’. We see this particularly in “Losing My Edge” described as “an eight-minute, laugh-out-loud funny dissection of cool over a dirty electronic beat”. Released 10 years ago, a 35-year-old James Murphy stepped out from behind the decks and DFA Records to form the seminal Electronic Dance-Punk band, with his music-geek knowledge and credentials for all to see, and lyrical themes, the parallels to High Fidelity’s Rob seem pretty interesting to us. Lastly, we have Independent People by Halldór Laxness / Ólafur Arnalds, Eulogy for Evolution: Two works linked by Iceland and epic intent! Independent People is an epic novel looking at the struggle of Icelandic farmers living in poverty in the early 20th century, and their survival in an inhospitable landscape. Thematically, Laxness looks at the idea of independence and self-reliance, what it means and what it costs in order to be achieved. As well as it’s strong economic themes: an indictment on materialism and capitalism. There is also a strong tie to the rich history of Icelandic Folklore and Sagas- Laxness writes characters with lives steeped in fables and traditions; imaginations inhabited by elves, and ghosts. With lead character Bjarter being cast as a poet, rich in Iceland’s great oral tradition. With Eulogy for Evolution, Ólafur Arnalds sought to compose a continual suite for piano & string quartet (with occasional added instrumentation and electronic flourishes) that was conceived as a depiction of life from birth to death… an epic and successful goal. This poignant music is mostly delicate, and fragile, with a cinematic breadth – giving conviction of power to the suite’s stronger movements. Arnalds’ compositions sit firmly amongst those of his Icelandic peers, painting wide-open spaces and immersive soundscapes – Jóhann Jóhannson’s fragile compositions reflected throughout, and the climactic “30:55” conjuring Sigur Rós. With this pairing we hope to explore the influence of location and place on artistic works, whilst feeling the epic aspirations of both will create a compelling experience. NOW – we just need you guys to decide on which pairing we will run with this month: head over to our Facebook page and cast your vote. Voting will close 1pm GMT Friday 6th February – we will post the result later that evening. and I love the idea of books being more than books, or being, rather, something other than books. I think the ideal experience of my book would be like listening to music. Welcome to analogue; a book club that seeks to pair music to the books we read. Inspired by a shared love for music and literature, and the brief moments those two have intersected: a soundtrack in our mind’s ear, or lyric that echoes a favourite literary quote. Our hope is that these pairings will compliment and enhance the reading experience – highlighting themes in the text or helping to create a sympathetic world/environment, helping to carve out a little bit of space in our weeks & days to read and reflect: revealing new nuance in familiar texts and engaging us with new finds. As we delve into our book & record collections we hope to uncover gems, and tp explore the links between words and music, whether by shared themes or more obvious links (i.e. songs inspired by books, or vice versa). We will have a physical meet-up monthly in Belfast, Northern Ireland with book, music, and drinks. It will be a chance to discuss the past months’ pairing and look at the month ahead. Our hope is that those further afield will be able to join us online through social media and this blog. This is all a bit of an experiment, and we hope that you will all be a vocal community – sharing thoughts and ideas about whether a particular pairing worked, and the ways in which you think it influenced your reading of the book (whether positive or negative). Suggested pairings are also more than welcome! Join us on our Facebook page to join the community and become part of the conversation.